Goal: Conserve the long-term integrity of winter roosting sites for monarch butterflies throughout California by developing comprehensive site stewardship plans. Background: Each winter monarch butterflies (Danaus plexippus L.) from throughout North America migrate to winter habitat in Mexico and California, where they roost in sites protected from extreme weather. In California dozens of sites support overwintering butterflies from western North America. Responsible protection and management of these sites is critical for the long-term welfare of western monarch butterflies. We propose a collaborative effort to develop and implement site stewardship plans that ensure the long-term integrity of the major monarch butterfly winter roosting sites. Ongoing monitoring: monitor butterfly population status, changes in stand structure and microclimate, tree health, risk to humans and property, interactions with surrounding environment, etc. 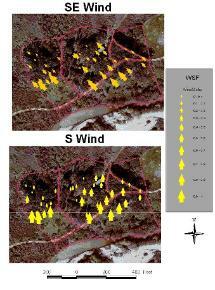 sensors, together with models of site changes over time, to engineer best management strategies. This comprehensive approach enables us to identify, maintain, and restore forest canopy structure that provides suitable overwintering microsites, with respect to solar exposure, temperature, and wind protection. Comprehensive Solutions: Our approach merges basic science, advanced technology, and adaptive management to conserve stand integrity of monarch butterfly winter habitat. We have applied this approach at sites throughout California and Mexico. Weiss, S.B. 2011. 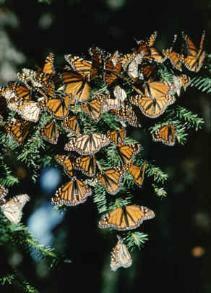 Monarch Habitat Assessment for City of Pacific Grove, CA. Creekside Center for Earth Observation Report. Weiss, S.B., and P.M. Rich. 2008. Recommendations for Restoration of Monarch Butterfly Winter Habitat at Norma B.
Gibbs Park, Huntington Beach, CA. Creekside Center for Earth Observation Report. State Park, Monterey County, CA) using hemispherical photography. Creekside Center for Earth Observation Report. hemispherical photography. Conservation Biology 5: 165-175.